One of the most popular and simplest esthetic dental treatments is tooth whitening. There are several different means available. Some are consistently effective, while others' safety and effectiveness are in question. Professional whitening versus whitening toothpastes and TV/ mail-order whitening - kits. Dentist-supervised whitening is by far the safest and most reliable technique. There are three categories of dentist-supervised whitening at Cassis Dental Center: "in office whitening, "home whitening" and "internal bleaching." In office whitening is the most popular technique. For those who prefer immediate results, this procedure is very effective. A small hand held device directs a high-intensity light on each tooth that has been coated with a whitening gel. In as short as one hour, a smile is shades brighter. Home whitening can be a follow-up for the in office procedure or done alone. Models are made from impressions. A clear custom-adapted tray is vacuum-formed to the model. This tray is then fitted to the patient with carbamide peroxide and worn for three to four hours at a time. Although results vary, most cases take from five to ten days. 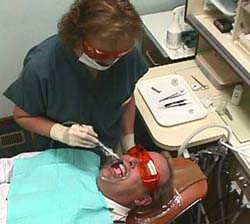 Internal bleaching refers to whitening of teeth previously treated with root canal therapy. If these teeth darken, a strong peroxide solution may be placed, by the dentist, inside the empty pulp area and left for a number of days until the desired result is achieved. Although the result may be esthetic, bear in mind that teeth "devitalized" by root canal therapy are hollow teeth, which tend to become brittle over time. A post followed by a porcelain laminate veneer or crown may be recommended. Occasionally, certain cases may be jump-started with a single visit of power bleaching followed by routine home whitening. Certain factors will limit the likelihood of successful whitening: smoking, frequent intake of coffee, tea or colas; decay, cracks in teeth, and/or poor oral hygiene; existing tooth-colored fillings in front teeth; exposed roots due to gum recession, and severe tetracycline staining. Whitening is not recommended for patients unable to stop smoking during treatment since bleaching may increase the chances of cancer caused by smoking. It is also not advised during pregnancy, as no long-term effect studies are available. Whitening toothpastes employ an abrasive to remove the sticky smear layer, They also contain carbamide peroxide, the same main ingredient in office-supervised home bleaching. However, the contact time (or lack thereof) is critical. Dentist-dispensed systems utilize custom-adapted trays fitting snugly against the teeth. These trays hold the carbamide peroxide against the teeth for four or more hours at a time, over a number of days or weeks. Over-the-counter or mail order and TV promoted kits make up another segment of the realm of products available to the consumer. Promises quickly outshine results. The majority of these products operate via a three-step approach: 1) an acidic wash or rinse removes the sticky outer layer; 2) hydrogen peroxide or another agent bleaches surface stains, and 3) the teeth are then polished with a titanium dioxide paste. This paste merely tints or temporary pigments the teeth white. The result is not natural in appearance, nor is it lasting. Although inexpensive and readily available, these kits may be harmful. A zealous bleacher may actually harm the enamel if the solutions are used too often, and kept in the mouth too long. Chipped or fractured teeth, gaps or spaces between teeth, and even crooked teeth can be corrected with bonding, veneers, contouring, and crowns. If the chips are minimal, bonding is an appropriate solution. If the damage is greater, bonding may suffice as a short-term solution, however, porcelain laminate veneers will provide a beautiful long-term result. Crooked teeth can be given the illusion that the teeth have been shifted into perfect alignment by a combination of cosmetic contouring, augmentation, bonding, and veneers. If more than half a tooth has been lost, a crown is usually the treatment of choice. Composite resin is a light-cured (hardened) material which allows almost infinite working time to shape or "sculpt" near-perfect teeth. The versatility, beauty and strength of composite resin bonding make it an option for a wide variety of applications. There is no other facet of cosmetic dentistry which is so entirely dependent on the dentist's hands-on artistic skills. Porcelain laminate veneers are often used to fill gaps or spaces between the teeth, as well as to create a more pleasing smile. A veneer is a very thin facing which covers the front surface of a tooth. After reshaping and slightly reducing the outer enamel layer, an impression is made and sent to a laboratory. At the next visit, the veneers are bonded to the teeth. Although veneers may also be made of composite, it is seldom chosen since composite veneers will stain or chip far sooner than porcelain. Cosmetic contouring is the art of reshaping the enamel in order to create a more favorable appearance. An example of a prime candidate for contouring is an excessively pointy or fanglike canine. The point can be smoothed off to give a softer, more pleasant look. Contouring is also useful in cases where minor chips or tooth length discrepancies warrant subtle correction. As mentioned earlier, cosmetic contouring, in combination with augmentation, bonding, and veneers, can give the illusion that crooked teeth have been shifted into perfect alignment. Bridges, implants, and dentures are all alternatives for missing teeth. Teeth missing from your smile are more than just a health problem, they are also embarrassing. There are two recent high-tech solutions to missing teeth: the "Concepttm" and "Glasspantm" bridges. Glasspantm is a flexible ceramic rope used to support a false tooth between adjacent teeth. The Concepttm bridge uses a false tooth with wing-like extensions which reach out over and bond to the adjacent teeth. Both bridges offer outstanding cosmetic results, though neither have been used long enough to predict their longevity, However, these techniques offer cautious optimism over the irreversibility of traditional bridgework. Crowns are used to restore both strength and beauty to an otherwise dysfunctional or unsightly tooth. The "natural crown" is the portion of the tooth visible above the gumline. In restorative dentistry, a seemingly "natural crown" is either cemented or chemically bonded to the underlying tooth structure. Caring for crowns is as simple as daily brushing and flossing, and avoiding excess coffee, tea, and nicotine.